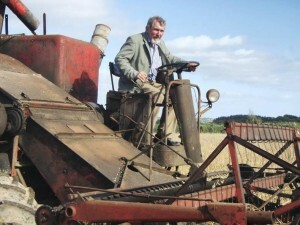 The October Blarney & District Person of the Month is businessman Mick Forde for his work in putting Grenagh on the tourist map, and creating extensive local employment opportunities, with ‘The Farm.’ Opened in 2012 by Millstreet’s Joanne O’Riordan, The Farm Grenagh has quickly become an attraction for local, national and international tourists. Visitors can experience a unique view of life in rural Ireland on a traditional working farm with 40 acres of native crops, and meet Irish animals including puppies, kittens, rabbits, pigs and calves. On the working farm, visitors get up close to the farm animals and stroll through the corn fields, meadows and groves. A fantastic benefit for families is that the area has disabled access to all of the farm. Visitors can reconnect with where their food comes from and imagine what life was like in the past when farmers were self sufficient. The Farm also showcases the 1950-1970’s era in rural Ireland, and in particular the effect of electrification on rural areas and agriculture. The 1960’s village is another aspect to The Farm and offers a unique insight into rural villages of that time. Including a café, conference facilities, an indoor toddlers play area, gardens, a forge, an outdoor play area and picnic areas this wonderful amenity has become an important destination in the tapestry of Irish tourism. Constantly evolving, their annual harvest festival drew record crowds this year and featured on Nationwide. The Farm further re-invents itself in December when Mr and Mrs Claus move in and it becomes The Christmas Wonderland. Mick Forde, who’s background is in steel fabrication, said on opening that this facility is something that he has always wanted to do given his own farming background.